This section is going to go over all the basics of coming up with a great podcast idea, how to create it and a ton of simple things you can do to produce your first podcast. Don’t worry, this whole course was created around the premise that you aren’t a computer programmer or “techno geek” and will be very easy to understand. In a moment you'll get a chance to do your very first podcast. It's easy. It's free. And it should take less than 10 minutes (although your actual podcast will only take about five minutes). As you read through this book you will discover that content is a vital to finding and keeping subscribers. So before you began your first podcast, start out on the right foot by creating good content. While some podcasts have fancy sounds and a witty host and guests, your initial podcast will just be you but it will still be posted on the Internet, so you want to make a good quality podcast, especially if you fall in love with podcasting and want to continue. 1. Spend 1 to 2 minutes and brainstorm some topics you are interested in. He doesn't have to be new and brilliant content for your first podcast, it should simply be something you have a passion for. 2. Select one or two of those topics that catch your eye. 4. Group those facts together under one or two headings. 6. Go online and find a web site that talks about that topic as well that you can review in your podcast. 7. Write down an upcoming event that is related to your area of interest. For example, if the area you're going to podcast on his genealogy, you might be able to find a local genealogical society which has a genealogy fare coming up. If you can't find anything, think of a past event that you can review. 8. Develop a brief script on your own, or from the example in the Example box that follows this exercise. EXAMPLE “Hello and welcome to our very first podcast at [your web address, which you will get shortly… in the next exercise]. My name is [your name] and today we’re going to be talking about [your topic]. In this podcast we’ll be talking about [heading #1] and [heading #2]. Later, we’ll review a website and talk about an upcoming event. First, we’re talking about [heading #1]. Did you know that… [talk about the interesting facts you wrote down]. Second, we’re talking about [heading #2]. Did you know that… [talk about the interesting facts you wrote down]. Now is the time in our show where we review a website. Today’s website is [say the web address and the name, if it’s different]. [Briefly describe the website and rate it on how helpful or informative it was as well as how easy it was designed to navigate around]. Finally, we’ve got to mention the [upcoming event]. [Mention who, what, where, when, cost, what to bring, what to expect]. That was easy, wasn’t it? Sure! There’s nothing to it. You probably don’t even need the script, but in cast you do, you have one available. It’s a good idea to work from a script, even if you don’t read it directly, to help you stay focused. Now you have heard other podcasts and you’ve created your own script. Are you ready? Let’s podcast! Becoming a podcaster is so easy! Why not try it out right now for free, and see if it’s something you’re interested in doing on a regular basis. There are two excellent methods available for podcasters and we recommend you use them both. The first is a free way that you can use to try out podcasting and see if it’s for you. 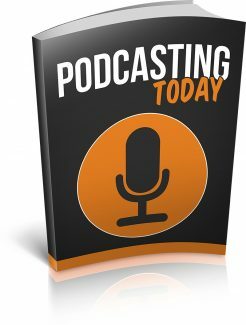 It lets you create simple 5 minute podcasts for free! All you need to do is sign-up at their site. First you’ll be creating a blog, which is like a personal web page but designed to let you voice your opinion. Remember, they were the forerunners of podcasts. EXAMPLE: A blog is like your very own personal journal or diary, but one that you leave open for others to read. It can be about personal things, about your job, about your favorite hobbies, about a pet. Anything of interest to you that you might write in a diary can go in a blog. You don’t have to have a blog in order to podcast, you just have to have a web page. However, if you want to podcast for free, creating a blog (as we will shortly) is a quick and painless way to get a place to put your podcast. Please note, this is just for beginning podcasters. The other program (described later) is more appropriate for the serious podcaster who wants to either supplement their current income or even earn a living from podcasting. This following instruction is mainly for the hobby podcaster with opinions to share with the world, and for people who want to see what it’s like before they invest in more serious podcasting. The first program can be found at: http://www.audioblogger.com/and essentially all you do is call their telephone number and deliver a podcast up to 5 minutes in length.